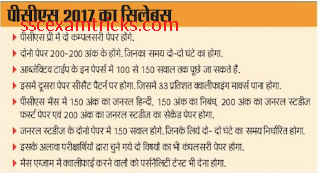 UPPSC PCS 2017 Mains Admit Card 2018 - UPPSC Upper Subordinate Mains Exam Date - UPPSC Regional Inspector Admit Card 2018 Call Letter Exam Date - UPPSC Combined State Upper Subordinate Admit Card 2018- UPPSC PCS Mains Hall Ticket 2018 - www.uppsc.up.nic.in. The good new is that UPPSC PCS 2017 Mains Exam Schedule has been uploaded now. The date of exam, session, subjects and questions paper has also been mentioned with date of examination. Some instructions are also discussed with this notice. The link to download UPPSC PCS Mains Exam Schedule has been provided in direct downloading link section given in the end of the page. Today, the breaking news is that UPPSC has uploaded the online admit card for the preliminary examination which has been scheduled on 24th September 2017. Those candidates who have been applied for this examination and now waiting for their online admit card; they can download their admit card from the link given here. The written exam date for UPPSC PCS 2017 has been announced and scheduled on 22nd June 2017. The admit card will be available on 12th June 2017 at website www.uppsc.up.nic.in. The final selection is to be made through evaluating performance in preliminary exam, mains exam and personal interview of the candidates. The pre exam qualified candidates will be main exam will be comprised of Paper I, Paper II and Essay writing. Previously, UPPSC had opened registrations for PCS posts from 22nd February to 22nd March 2017 on official website in which a huge numbers of eligible candidates had shown interest and filled application form with application fee on or before 22nd March 2017. Now these applicant are waiting for release of online admit card for Preliminary examination which is scheduled to be conducted on 22nd June 2017. Those candidates who have been preparing for Upper Subordinate Exam 2017; they can download their UPPSC PCS Pre Exam Admit card 2017 from direct link given here. · Go to the official website www.uppsc.up.nic.in. · Fill the form carefully and verify all the particular detailed in the application form. · After filling the form, click on submit button. · Pay the application fees. · After that upload all yours scanned documents. · Upload your photo, signature and thumb impression. · After that press the final submit button. The following steps are needed to be followed for easy downloading of UPPSC Upper Subordinate Admit Card 2018. · Click on the link mentioned below. · Enter registration number, date of birth, gender and enter verification code. · Press ‘Download Admit card’. · Take printout of the online admit card on A4 size photo. The good news is that admit card for UPPSC Regional Inspector has been released now. Don't forget to bookmark us (www.sscexamtricks.com) by pressing ctrl+D on your keyboard. In case of any query or doubt, ask through commenting in the box. Our team will help you into the matter.